I said “if the socks are well hidden”, cause sometimes you thinks they are when you are standing in front of your mirror. But, the minute you sit, bam, your Nike socks show in between your beautiful pants and shoes. A true outfit killer. Therefore some opt for the safe solution and buy only black quality socks. That is an option. If you consider there are no such thing as stylish socks. If you have been looking at the fashion shows, on magazine and even in the street, you know socks are the peak of the style thoses days. Yes, yes, but isn’t this trend just for crazy fashionistas who parade during fashion week hoping to catch the attention of a street style photographer? I think everyone can use this trend! 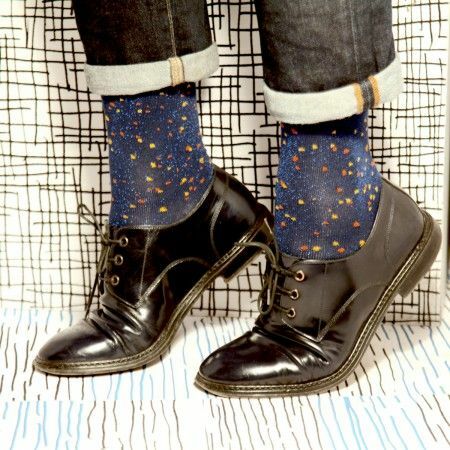 First stylish socks have been a thing since a long time in men fashion. Our former prime minister François Fillon, who dresses in a conventional way as his job requires, is famous for making a fashion statement by wearing red socks! Now, in Paris, the trend is exploding for both men and women and you find very pretty socks in you corner Monoprix shop. 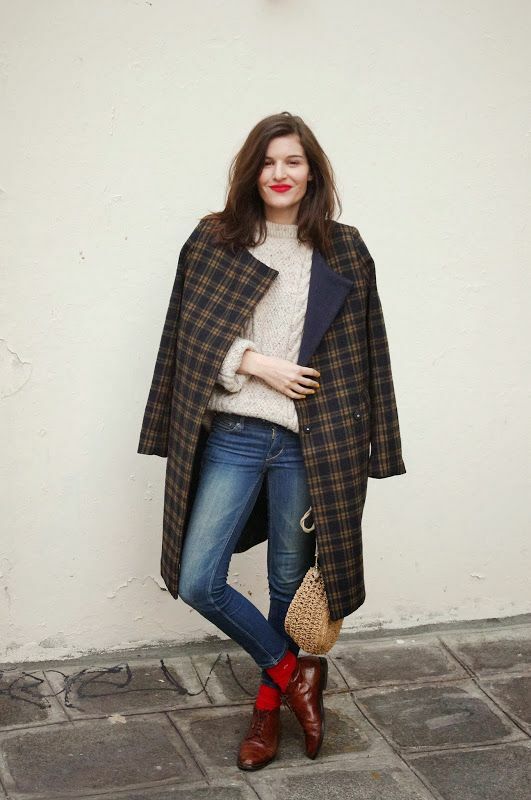 So here are my tips on how to make stylish socks your thing. The 7/8 pants have been a huge trend since two years but often my clients regret that they make the ankle freeze. Socks are the perfect way to cover that area while keeping it thin. 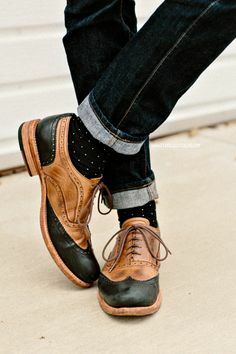 You can go for a masculine look with a twist: loafers, derbies and brogues paired with feminine socks like lurex, sheer or even just lightweight ones. Btw, the lurex is the biggest trend right now. 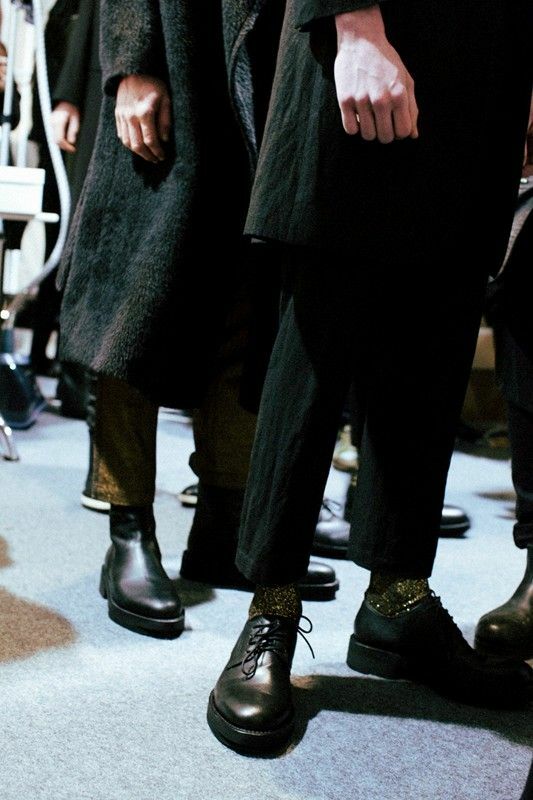 Ann Demelemeester Fall 14 menswear. 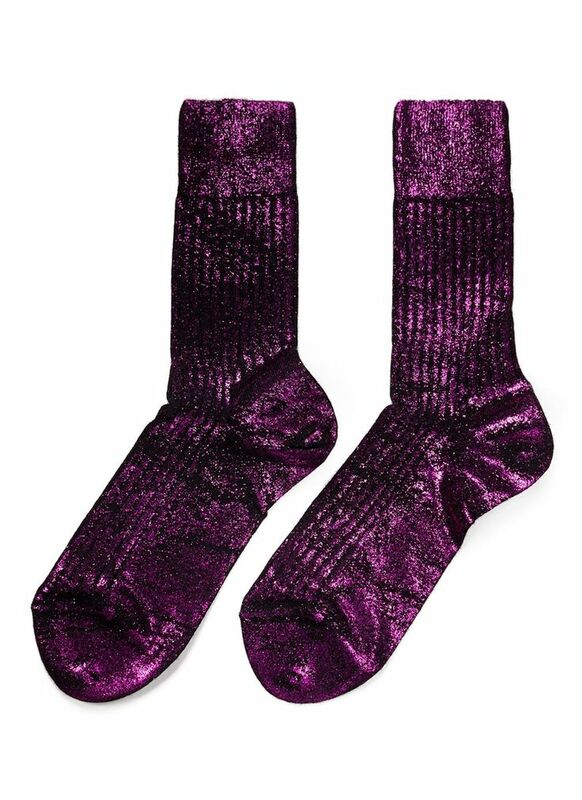 Lurex socks. Unknown. Lightweight simple black socks with the hits of the moment: Adidas superstar and Levis 501. You could also do that with ankle boots or sandals. Any skirt lenght would be nice. Though beware not to look frumpy if you choose the midi lenght. I recommend to use ankle socks or over the knee socks but, even though some very daring fashionistas who would try everything do it, I do not recommend you to wear mid calf socks with skirts. Looks mumsy. For black on black, choose sheer tights so that you can actually see the socks. Just a glimpse above ankle boots. 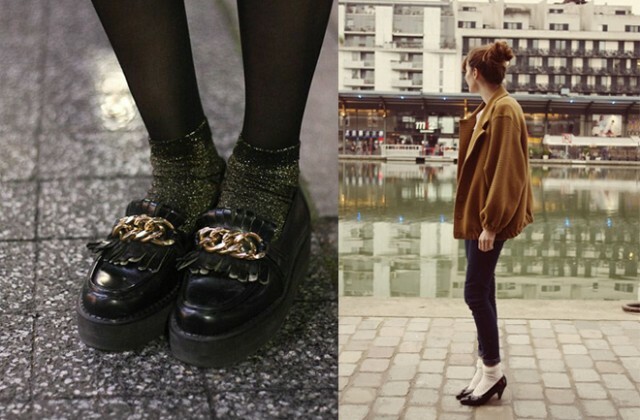 Wear chunky socks and frown them over your doc martens or combat boots for a cool casual look. They could be chunky shiny also. 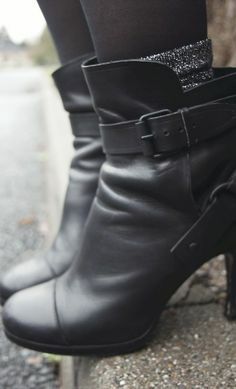 You could wear them with flats (derbies, brogues, loafers, creepers), with ankle boots, with high boots (use over the knee boots), with pumps or with sandals. II. What socks should I choose? To show how thin your ankle is. They could be very simple and not be noticed, but always think to choose thin socks if you show the ankle. Even though he was stylish, I do not think the Michael Jackson is flattering. They shall be lightweight too. They often include lurex in the components. You can choose them plain or printed. 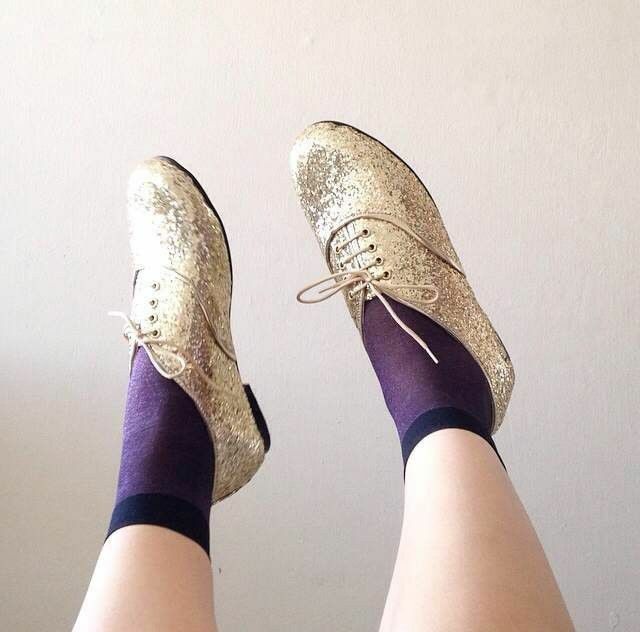 I recommend avoiding the sequins socks trend. Too chunky. Super feminine. Not very warm. Works on bare legs only. With flats, pumps or sandals. Skirts or pants. That are lighweight of course. And they can be shiny too! Only if the shoe covers your ankle. More casual than the lightweight delicate socks. There was some fashion hysteria about sport socks last year. But. Let’s be honest. Erm. No. And, you? Do you use you socks as a fashion statement or you just don’t care? Haaaa c’est parfait les (belles) chaussettes ont été mes achats fétiches des soldes …. Merci pour ce petit guide! Je veux pas passer commande mais si tu avais des conseils pour porter…. La salopette et la combi ce serait top…. La dernière fois que j’ai porte les miennes on m’a demande les clefs des toilettes au café (véridique), faut croire que j’avais plus l’air du handyman du resto que d’une fille stylée malgré mes accessoires girly! Juste au cas ou;) merci pour ce site et tous ces chouettes conseils en tous cas. Moi aussi j’ai adopté la chaussette : à paillettes avec jupe et collants noirs, ou fluffy grise avec jean slim 7/8e. Ca a effectivement l’avantage de réchauffer les chevilles et ça amène un peu de couleur à la tenue ! Are there any guidelines for wearing socks stylishly if you have large legs and calves? Does wearing visible and colored socks cut the leg and make it look shorter and thicker? 7/8 always tend to shorten the leg. If worn with socks the same color, it does not, but with colored socks it does. 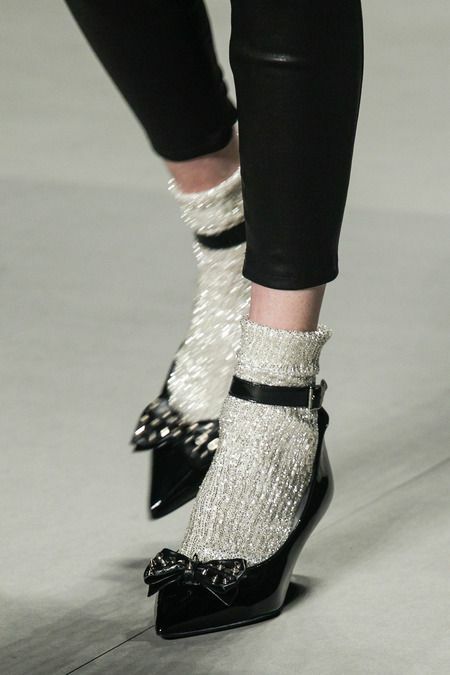 But if you like that trend and worry about shortening your legs, then try the socks with heels and 7/8 pants!